One of the Blue Disa farmers gives onlookers a demonstration on how to correctly replant the bamboos shoots. 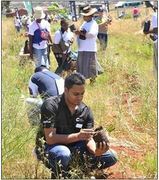 (PRLEAP.COM) April 8, 2014 - Johannesburg, South Africa – The multifunctional printer and copier distributor, Konica Minolta South Africa, joined members of the rural Blue Disa community in Lawley, south of Johannesburg, to bed down the first of 4,600 bamboo plants. These plants were donated by the Bidvest Group through its initiative with South Africa's national greening and food gardening social enterprise, Food & Trees for Africa (FTFA). The 31 hectares of bamboo join five hundred River Bush Willow trees planted at Blue Disa by Konica Minolta South Africa in 2013. 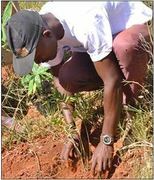 They form part of the organisation's continued dedication to address environmental issues, while enriching the lives of surrounding communities. At the planting, the company was officially presented with a certificate from FTFA, acknowledging that the Carbon Protocol of South Africa (CPSA) has named Konica Minolta South Africa as being "carbon neutral" for the period 2012/2013.